Can anyone help me improve my set up? I have a Midland multi CB, and a Firestick aeriel (the long one) mounted to the wing mirror, at it's furthest point, on my Laika Motorhome, which is an all aluminium bodied coachbuilt, and am using an electronic ground plane assembly, which, although has improved things, still just creeps into the red on the SWR meter. I have disconnected the coax and checked the plugs using a multimeter for continuity, and 'shield-shorting', all of which checks out fine. Ive checked the plugs have been soldered in the correct fasion, and all is well. Should I try to wire an 'earth strap' from the base of the mount to the chassis of the motorhome? Would doing this effect the electronic ground-plane? I have a 'tow car' which the wife drives ahead of me while on holiday, it is fitted with a second Midland Multi, and a base loaded orbiter-type whip, just a small one, via a mag mount, and the performance of THAT unit blows the other away!!! 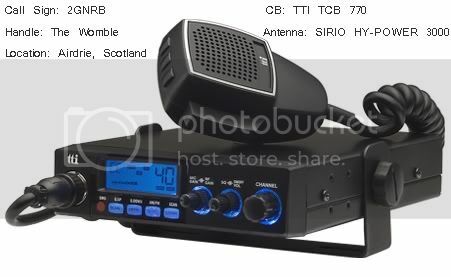 What is the secret to fitting a CB to a motorhome, and any suggestions for improvement???? I'm no expert in motorhome/caravan CB fitting but I'm good with cars and trucks but I would suggest earthing it to the chassis! It sounds to me as if you have a ground plane problem. If it were cable related or a short circuit then the SWR would normally be right over to the right of the red, i.e. 10 plus. The problem is that motorhomes can be tricky things! You say an electronic ground plane kit made it better, but it is still not right. I would then probably suggest running a wire from the mount to an earth point and see what happens? If it is no better then could you reposition the antenna? Maybe use a different mount? Remember a Firestik which is most likely a 5/8 wavelength is electrically a large aerial. This means earthing is paramount. Checkout the Firestik website: http://www.firestik.com and go to the tech help section to find all you need to know about mounting an aerial. My motorhome is currently in having new shoes fitted to the rear, and new tyres all round. I get her back on Monday night, so that gives me plenty of time to 'bone up' on my set-up. I haven't yet ruled out cutting a 1 m/sq of 16 guage sheet metal, spray painting it white to match the van, bonding it to the roof of the motorhome, and attaching an earth strap across to the earth point for the solar panels. I could fit a smaller base loaded whip via a mag-mount which may (or may not!) survive overhanging tree branches, but would have a good ground plane, and be a LOT higher!! What are your thoughts? Would I just be wasting money? Is the mirror bracket on the cab door like a lorry? If so you should be able to take an earth strap from the chassis and connect it to the mirror bracket or even better to the aerial bracket direct. Also is the Firestik the type wher you trim the wire at the top to adjust the SWR or a screw adjustment? It can be difficult to SWR Firestik aerials. I wouldn't put a mag mount on the roof and would avoid putting a steel plate on top with the aluminium as they are disimilar metals that would react with each other and corrode! The motorhome is a coachbuilt-type body, and the mirrors that they have used are the same ones as used on a Iveco 3512, solid aluminium frames with the mirror as a plastic unit. I'm currently using the same type of bracket that the truck drivers use, and have it bolted to the mirror's frame. I have fitted an earth strap to the bolts that hold the mirrors in place on the body (behind the trim, so that it doesn't look unsightly, with good solid terminal-post connectors, crimped,soldered, and protected by the door trim and copper grease) which runs straight to the chassis. So, in theory, the whole mirror frame should already be earthed! However, even with this in place (the frame is earthed correctly, as I checked it for continuity to the chassis with a multimeter) and even with the groundplane kit (which has a small adjustable aeriel at the bottom) I cannot seem to get the SWR out of the red. The firestik aeriel is a 'screw adjustable' type, and as I adjust down (shorten?) the aeriel, the SWR improves. At the moment I have it at the lowest setting, but it's just, not quite, enough to get it out the red, while the groundplane aeriel works best set at approximately mid-way. The aeriel itself is in a position some 35cm away from the body, with a good 3/4 of the aeriel completely clear of the body (no reflections). In theory, it should be a very robust set up!!! But I just can't seem to get the SWR away from the red. It only justs creeps into it, to the point where the whole width of the needle isn't quite in, so do I really need to worry about it? Am I just being picky? I could still get away with the 'roof mount', as the whole of the roof is covered by a GRP cap, so there wouldn't be any metals to react with. Have I just been spoiled by my old Sirio 827, and expect too much from my firestik? Is it impossible to get a motorhome rig to perform as a well-sorted car rig with a mag-mount? Have you got another SWR meter you can check against or another aerial you can use just to check your readings. In theory (!!) all should be well so if you can cross check it would prove either the aerial or meter may be the problem. I would keep trying to get the SWR a bit lower than indicated at the moment. Waiting to get my van back from the garage, currently getting checked over for a six month stint through Europe. Tried a different aeriel, it DID make a difference, although it was for the worse!! Hi Paul...This is only a thought but I think it may have been better if you re-positioned the different antenna in a different place! You should give that a try! That is an option, but I really don't want to go down that road if I can possibly avoid it!! Any higher, and it WILL get nailed by branches!! I'll have another fiddle when it gets back. I only need a tiny little improvement! I am going away in my sister's caravan at the fair holiday with my parents and I am going to take my CB. Where would I place my mag-mount as the caravan is made of fibre-glass and I do not want to buy a new antenna! I have a 7ft SIRIO HY-POWER 3000 and a 3ft Springer. Where is the best place to put the antenna apart from parking the car next to the caravan and sticking it onto that?